President Recep Tayyip Erdogan has declared victory in the referendum on Turkey’s constitutional reform package. With most of the ballots opened, over 51 percent of voters have supported expanding the powers of president. The head of Turkey’s Electoral Board has confirmed the result of the referendum, saying the “yes” vote has won. The final results of the plebiscite on amending the constitution to significantly expand the country’s presidential powers are to be announced in 11 or 12 days, he said. 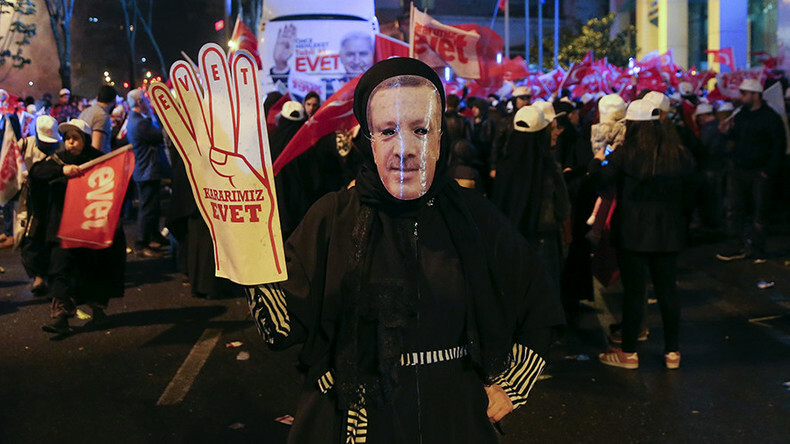 Erdogan said that unofficial results of the plebiscite showed that around 25 million people said ‘yes’ to the constitutional amendments, beating the ‘no’ vote by 1.3 million. — ANADOLU AGENCY (ENG) (@anadoluagency) 17 апреля 2017 г. He called the ‘yes’ vote a historic decision by the Turkish people, expressing hope that it will benefit the country. "Turkey for the first time in its history has decided with the will of the parliament and its people on such an important change. For the first time in the history of the Republic, we are changing our ruling system through civil politics. That is why it is very significant,” he said. Turks living abroad have played a major part in the success of the referendum, which will pave the way for one of the most important reforms in the country’s history, Erdogan said. The President also addressed the international community, saying that everyone should respect the decision of the Turkish people, especially those countries which call themselves Ankara’s allies. Erdogan said he will “immediately” discuss the issue of restoring the death penalty with the Prime Minister and the leader of the Nationalist Movement Party. Erdogan said the step is necessary to punish the plotters of the failed coup last summer. — ANADOLU AGENCY (ENG) (@anadoluagency) 16 апреля 2017 г. Earlier, Turkish Prime Minister Binali Yildirim also said that the unofficial ballot count showed that the ‘yes’ vote was ahead. According to the PM, Turkey was opening a new page in its democratic history with this plebiscite result. Striking a conciliatory tone, he said authorities viewed those, who voted “no” on Sunday, the same as those who supported the expansion of presidential powers. Yildirim also said he will now be making the necessary preparations for the presidential election to take place in Turkey in 2019. Around 98% of ballots have been counted, Turkey's state-run Anadolu news agency says adding that the "yes'' votes are leading with 51.32%. The lead has narrowed to three points. The leader of Nationalist Movement Party, Devlet Bahceli, who supported the constitutional amendments declared victory in the referendum. He also praised the Turkish people for withstanding “pressure, blackmail, imposition, force, and threats by the whole world” to make the right choice. Polls closed at 4:00pm (13:00 GMT) in the east of the country, and 5:00pm elsewhere. The referendum, in which 55 million people eligible to vote, saw a high turnout of 86 percent, Haberturk broadcaster reported. Despite the "yes" vote leading in total, the support for constitutional amendments was far from overwhelming in some regions of the country. Less than 33 percent supported the expansion of Erdogan’s powers in the mainly Kurdish province of Diyarbakır, with the "no" vote standing at 67 percent, Anadolu agency reported after 90 percent of the ballots were counted. Similar moods were reported in the Izmir province. The “no” vote is leading in the Turkish capital, Ankara, where 51.6 percent rejected constitutional amendments after 80 percent of the ballot counted, according to CNN Turk. Istanbul also looks to have rejected the reform. The Anadolu agency released unofficial results of the vote in Germany, where around 4 million Turkish citizens reside. Nearly 63 percent of German-Turks apparently voted ‘yes’ in the referendum, which led to a rift in relations between Ankara and Europe. 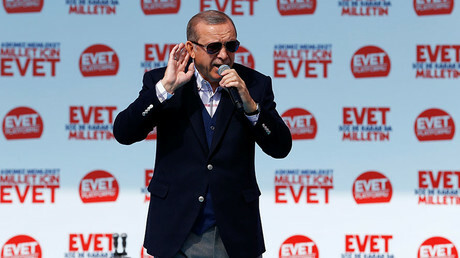 Erdogan blasted the EU as “Nazi” and “fascist” after Germany, the Netherlands, and Austria banned rallies organized by Turkey to promote the plebiscite or in some cases prevented Turkish ministers from appearing at the events. Turks living abroad cast their ballots on April 9, but their results will be released on Sunday along with those of the voters inside Turkey. Turkey's Supreme Election Board said on Sunday that it had made an “unprecedented” decision to deem valid and count the ballots that didn’t bear the board's official seal, AP and Reuters reported. The move was explained by the fact that many voters complained that they were handed ballots without the official stamp in the referendum. In order for the ballot to be considered invalid it has to be proven that it was cast fraudulently, the board added. The Turkish opposition refused to accept the results of the referendum, saying it’s going to demand a recount of a large part of the votes. “Since this morning, we have determined some 2.5 million problematic votes,” Erdal Aksunger, Republic People's Party (CHP) spokesman said, adding that 37-60 percent of the ballots might need a recount. The pro-Kurdish Peoples' Democratic Party (HDP) said it’s going to object to two-thirds of the vote. “Our data indicates a manipulation in the range of 3 to 4 percent,” HDP wrote on Twitter. The referendum mostly passed off in a calm atmosphere, with the exception of a few incidents. In Diyarbakir Province, three people were killed outside a polling station, as two of the local clans clashed over political differences. In Istanbul, it was reported that a crowd verbally attacked an opposition journalist for speaking out against the expansion of presidential powers. The “Yes” vote will potentially see the current parliamentary system in Turkey replaced by an executive presidency by 18 constitutional changes, representing the most drastic reform in the country’s governance since the modern republic’s foundation in early 1920s. Among other things, the new powers would allow Erdogan to issue decrees, declare emergency rule, appoint ministers and state officials as well as dissolve the parliament. He could also potentially stay in power until 2029, while the prime minister’s position would be abolished. The Turkish leader has been persistent in his claims that the parliamentary system prevents good governance in Turkey by pitting the president against the PM. He argued that the changes to the constitution are paramount at the moment for him to restore order in the country after the failed coup attempt in summer, which Ankara blames on religious figure Fethullah Gulen, who is now in exile in the US.